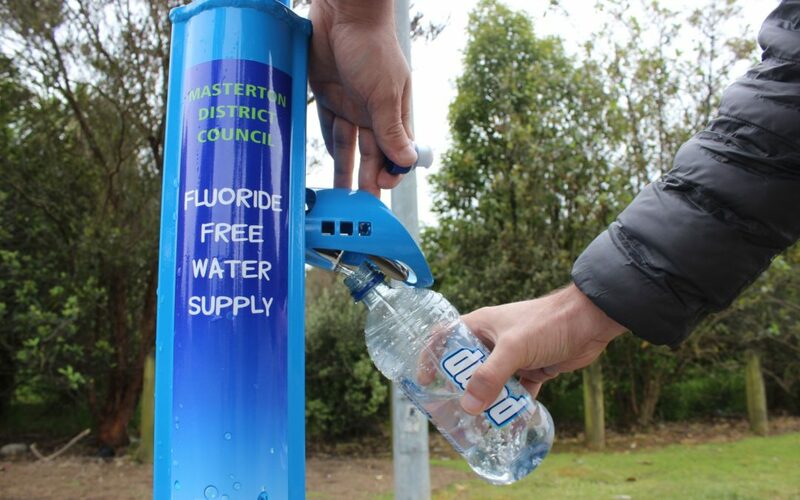 Masterton people now have access to fluoride-free water with the installation of a tap on Manuka Street, but some are calling for more drastic change. The idea of supplying non-fluoridated water came from submissions made to the 2015-2025 Long Term Plan. The unit cost $5000 to install, with another $5000 spent to connect to the Opaki Water Supply. Fluoride Free New Zealand national co-ordinator Mary Byrne said it was a step in the right direction, but more extreme change was needed to combat fluoridation concerns. Masterton’s water supply comes from the Waingawa River and the water is treated at a plant at Kaituna before being piped 8km to the urban area. Treatment includes adding chlorine as a disinfection and fluoride as a public health measure. New Zealand was behind the rest of the world in regards to eliminating fluoride, she said. Ms Byrne said top fluoridation promoters had identified fluoride has to be applied to the teeth to work, not swallowed. The long-term effects of fluoride were not yet known, but would be discovered in the coming years, she said. Masterton resident Stephen Butcher has been a strong advocate for the availability of fluoride-free water for the public, and identified the progress in Petone as a benchmark that Masterton should work towards. The process had been long and drawn out, although it was good to see progress being made, he said. Masterton District Council spokesman Sam Rossiter-Stead said the idea was first mooted in June 2015 after they had received a number of submissions.